The Ghana Medical Association (GMA) has kicked against the legalization of commercial motorcycles – Okada -, citing that it will lead to more people being sent to the emergency units of health care centers. According to them, legalizing the use of Okada’s in the country with definitely increase the rate of motor accidents. Hence their decision to stand against the initiative to try and preserve lives. They opine that the cost of managing victims, both in economic and social terms, as well as the strain on health personnel and fragile health services, could have been saved and channeled to other sectors of the economy if Okada is not legalized. In a press statement on Sunday, the GMA called on government and stakeholders with diverse interests in the subject to consider the issues holistically with appropriate stakeholder engagement. 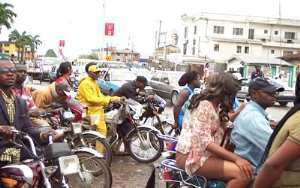 “Legalizing the operations of “Okada" under the current prevailing circumstances is more likely to increase the risk to the riders, pedestrians, and other road users,” the statement signed by President of the GMA, Dr. Frank Ankobea said. The position of the GMA is backed by available statistics from the National Road Safety Commission [NRSC]. Figures from 2014 alone show that 2,571 people were knocked down by motorists out of which 1,856 lost their lives. In 2015, 2,289 motorcycles were involved in road crashes nationwide while in the first quarter of 2017, about 708 road users died from 4,049 road accidents, with 3,983 others sustaining various degrees of injury. His statement seeks to reverse Sections 128 (1), (2) and (3) of the L.I. 2180 of the Road Traffic Regulations, 2012 which prohibits the use of motorcycle or tricycle for commercial purposes.